Christmas - the season we all look forward to. A season of prayers, merriment, parting and fun. And what better way than some cool jokes to celebrate the fun that we all have in this cool season? KidsGen knows your mind. 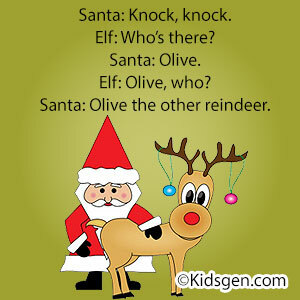 So here we bring to you a collection of genuinely funny jokes related with Christmas eve. Read them little ones! Add them to your kitty! Be the cynosure of your friends the next time you attend a Christmas party. Watch the smile in your friends' lips. If you like our jokes, you can click here to refer these to whoever you want. Have a great Christmas! Caleb: What does Christmas have to do with a cat lost in the desert? Caleb: They both have sandy claws. Noah: What is a bird’s favorite Christmas story? Mike: I haven’t a clue. Noah: The Finch Who Stole Christmas. Will: Where do snowmen keep their money? Will: In a snow bank. There was once a great czar in Russia named Rudolph the Red. He stood looking out the windows of his palace one day while his wife, the Czarina Katerina, sat nearby knitting. He turned to her and said, "Look my dear, it has begun to rain!" Without even looking up from her knitting she replied, "It's too cold to rain. It must be sleeting." 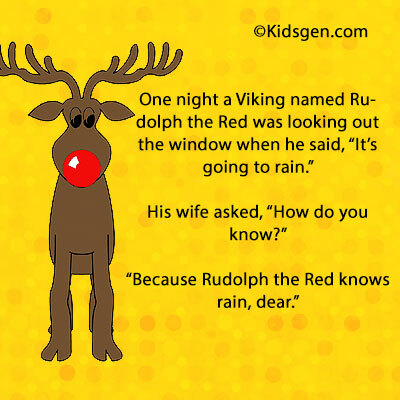 The Czar shook his head and said, "I am the Czar of all the Russias, and Rudolph the Red knows rain, dear!" T'was the night before Christmas and all through the house, Not a creature was stirring, not even a mouse. The stockings were hung by the chimney with care. They'd been worn all week and needed the air. Santa went to the Doctors with a problem. Doctor: What seems to be the problem? Santa: I seem to have a mince pie stuck up my bottom! Doctor: Well your in luck because I've got just the cream for that! Did you hear about the Beverly Hills school Christmas pageant? Two kids dressed as Mary and Joseph and they are on their way to the inn in Bethlehem. On the other side of the stage, a boy in a shepherd's outfit is on a mobile/ cellular phone, calling for reservations. Do you know what it is like to put up fifteen hundred Christmas lights on the roof of a house? The kids are giving two to one I'm gonna come down the chimney before Santa Claus does. Did you know that according to the song, "Rudolph the Red-Nosed Reindeer", Santa has twelve reindeer? Sure, in the introduction it goes "There's Dasher and Dancer and Prancer and Vixen, Comet and Cupid and Donner and Blitzen..." That makes eight reindeer. Then there's Rudolph, of course, so that makes nine. Then there's Olive. You know, "Olive the other reindeer used to laugh..." That makes ten. The eleventh is Howe. You know, "Then Howe the reindeer loved him..." Eleven reindeer. Oh, and number 12? That's Andy! "Andy shouted out with glee." The proof is in the song! A B C D E F G H I J K M N O P Q R S T U V W X Y Z? Oh, c'mon baby, let's you and I do Weeweechu. I love you and it's the perfect time," Pedro begged. Please, corazoncito, just once, do Weeweechu with me." "Weeweechu a Merry Christmas, Weeweechu a Merry Christmas, Weeweechu a Merry Christmas, and a Happy New Year. Moe: What are you going to give your little brother for Christmas this year? Joe: I haven’t decided yet. Moe: What did you give him last year? Santa: Olive the other reindeer. “Doing my Christmas shopping early,” replied the defendant. “Before the store opened,” countered the prisoner. 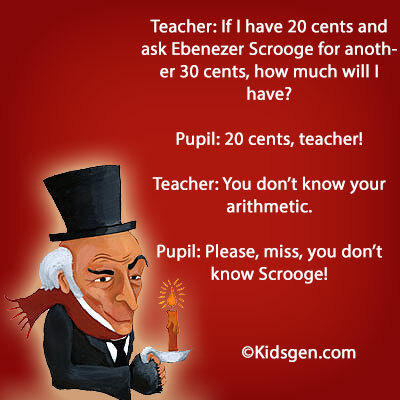 Teacher: If I have 20 cents and ask Ebenezer Scrooge for another 30 cents, how much will I have? At a monastery high in the mountains, the monks have a rigid vow of silence. Only at Christmas, and only by one monk, and only with one sentence, is the vow allowed to be broken. One Christmas, Brother Thomas is allowed to speak and he says, "I like the mashed potatoes we have with the Christmas turkey!" and he sits down. Silence ensues for 365 days. The next Christmas, Brother Michael gets his turn, and he says "I think the mashed potatoes are lumpy and I hate them!" Once again, silence for 366 days (it's leap year). The following Christmas, Brother Paul rises and says, "I am fed up with this constant bickering!" Two young boys were spending the night at their grandparents. At bedtime, the two boys knelt beside their beds to say their prayers when the youngest one began praying at the top of his lungs. I PRAY FOR A NEW BICYCLE..."
His older brother leaned over and nudged the younger brother and said, "Why are you shouting your prayers? God isn't deaf." To which the little brother replied, "No, but Gramma is!" The Santa Claus at the mall was very surprised when a young lady about twenty years old walked up and sat on his lap. Santa doesn't usually take requests from adults, but she smiled very nicely at him, so he asked her, "What do you want for Christmas?" "Something for my mother, please." said the young lady. "Something for your mother? Well, that's very thoughtful of you,'' smiled Santa. "What do you want me to bring her? " Without blinking she replied, "A son-in-law!" "I was thinking about Santa Claus. When you really think about it, this has to be the biggest, most elaborate prank in the history of the world. It's like we're all in on a huge joke we're playing on kids. And eventually they figure it out and they start lying to their kids, too." Good King Wenceslas phoned Domino's for a pizza. Darren remembers accompanying his father out shopping in the toy department of Hamleys one Christmas Eve.